What do you make of this? Interested if anyone has experienced or seen this before. I was driving, from the dealer, just had the car aligned. They said it was slightly off and did an alignment. The car drove better than it did and everything seemed fine. OK. Traffic in front of me, no issues, then WHAM! I though I hit something like a rock or stone, I saw debris in the drivers side mirror. I pulled over to check it and the drivers tire was fine so I continued on. As I go back on the road, the red air pressure sensor light appeared as I was emerging back onto the highway. PPulled over again and the passenger front was flat. I changed to the spare and inspected the wheel. No damage other than what you see here. Just the inner shelf of the rim. 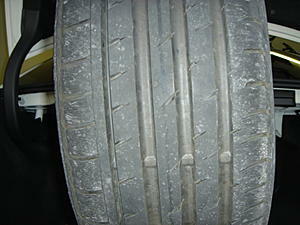 No tire damage apparent and the inner and outer lip are perfect. Whats going on? WOW. are thoes the 18 upgrades? i heard they were soft, vulnerable to cracking but that is crazy. Are they warrantied, cause even a "softer" wheel shouldn't do that unprovoked. Good luck! I had the same thing happen years ago with a set of Cragers. Hit the mother of all pot holes at 70 MPH both passenger side wheels destroyed. No, no warranty. Cost is around $885 or so. Plus tire. No pot hole, I even went back a few days later and looked again. I can't find even scratch on the car itself. Nothing on the fascia, nothing on the control arms, and nothing in the wheel well. No damage to the undercarriage protection at all. You can't see from the pictures but on the inside surface of the crack there are little black marks similar to what gunpowder might look like. No I am not saying there is gunpowder, if you look at the pics of the inside tray you can see some there, they are the black marks that have a rotational pattern. 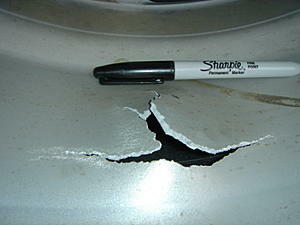 (I'm really going CSI here) so that means the same stuff within the wheel and on the inside surface. Last edited by tpick23; 09-08-2008 at 10:48 AM. you could probably do the $325 shipped as I doubt many people will be interested in this. wow thats the first time i seen something happen like that. If you didn't hit anything. 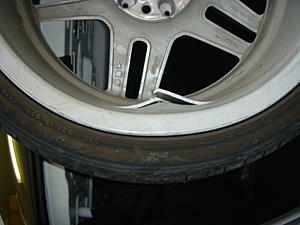 It could be a serious defect of the wheel! I would fight with the dealer about getting a new wheel. maybe a set of 4 new wheels!! Me to, man this is crazy.... and send an email to AMG with the pictures and look what they say about it!!! wtf! wow, that is some poltergeist ***** right there!!! But I will be seeing the dealer on Wednesday to sort it out. They say they can tell if I hit something which I would expect, and I thought I did but after looking at it, I'm not so sure anymore. It will be interesting to see if the alignment is still right on or not. They [I]are[I] new. The car has less than 2k miles. You should have warranty or insurance to cover that, you need to fight your way with the dealer. this just says one thing. OEM doesn't always mean it's the greatest. Brand name wheels aren't always top quality, replicas aren't always low quality. I'd be talking to a lawyer. Definite product safety liability problem there. 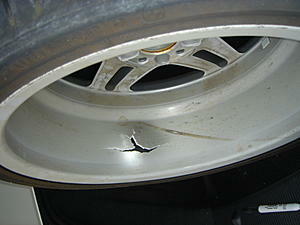 i saw someone hit a large bolt that went throught the tire and rim. I'd say you probably ran over a rock or some type of hard debris with tire pressure being on the low side. I agree. That's just not safe at all. No wheel should do that under normal driving conditions. damnnn.. if you got the rims from the dealer or someone reputed (not ebay), id still suggest you hammer them for a replacement. 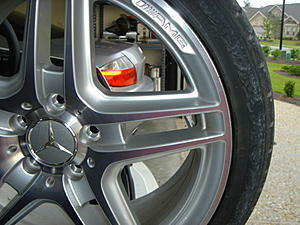 I have seen some thrashed AMG wheels, but never anything like that! That's crazy. I can't believe how thin the aluminum is. I would take a hard look at the tire of that wheel. You should notice something opposite since its a radial. 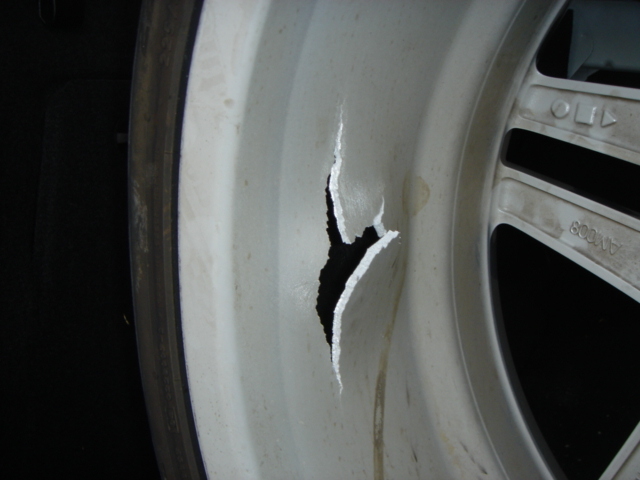 The damage is from the inside out of the wheel. Therefore I lean towards agreement with FrankW. that's really bizarre and incredible! I can't believe there's no damage to the tire. Talk to your dealership or MBUSA, that's not normal. what's so hard to believe? tire's soft, rim's hard, if you run over something very hard and smooth you probably won't damage the tire visually, but can cause serious damage to the wheel just like that.